Glitches and full bars on my phone! Incredibly expensive and it works about half the time. Don’t waste your money. "We're having trouble displaying this video." That is all it ever shows. I personally don't consider that a football game. Why do I keep getting the message “looks like your traveling video streaming is not allowed out side the United States”. I AM in the United States I’m working in Prudhoe Bay Alaska 99734. I have filed several trouble tickets but it is still not working here on data or WIFI. We get Jesse Jamed on the price of the Sunday ticket. With the amount we pay. We should be getting Red zone. Directv should be ashamed of this. App won’t accept my username/password. Tells me that it is not a valid combination. Seeing the same issue on my PS4. Sounds like this is a known issue going on this week but it is unsettling there hasn’t been more news from DirectTV on this since we are days away from wk 1. Please fix the login and password on the apps for the PS4 and iPhone by 9/9/2018. I can log in on my desktop but not on any of my devices. Please fix this! Week 1 is this week! I have the app for my Apple TV as well as my phone. The phone app works fine intermittently but the Apple TV is flat out broken. I also try to stream using a web browser and received another awful deign flow. Reaching desired content is not intuitive at all. The design team needs to do better. No idea how this app is rated 4.8 stars. The app will barely work, I would give it zero stars if that was an option, you’ll go long stretches where no games will be able to load. 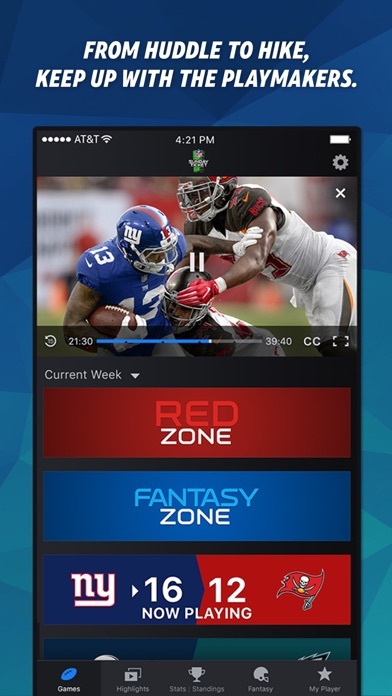 If you get Redzone, you’re much better off watching that as you’ll see the play on Redzone before you will on the app because the games are so delayed- if they do stream. It is extremely frustrating because this could be an excellent app- if it ever worked correctly! DO NOT PAY MONEY TO SUBSCRIBE TO THIS, YOU WILL REGRET IT. I spend around 300-400 bucks and can only watch about 70 percent of the games every week because most are blacked out?!? I purchased this because I believed that I would be able to watch EVERY nfl game. They black out most of the GOOD games each week. This is my first and last year purchasing nfl Sunday ticket. I pay for Sunday Ticket and I cannot watch the 700 channel games on either my iPhone or iPad because they all say they are blacked out for content??? I can only watch on my home television. I spent 1 1/2 hours on the phone with customer Service to no avail. PAINFUL!!!! Poor app quality, and replay not available on Monday night for Sunday game when they are supposed to be available after midnight on Sunday. Very frustrating as customer service could only say that the content needs to be available for everyone? Doesn’t make sense. boo Sunday ticket - you’re better than this. I purchased the NFL ticket because I travel a lot for work and wanted to watch my team and other games on my phone. Virtually all the games except for two were blacked out. There’s no point in purchasing it if you can’t get the games you want to see. Don’t purchase this product. I logged in this morning and started to watch the games with no problems. The Giants game went to halftime and I put the phone down. I go back ten minutes later and I had to re log back in. I then kept on getting a message saying that I am already logged in and I need to log out which you can’t do from the app. I deleted it and re installed it...same thing. I changed my password online and tried it again....same thing. Tried calling customer service and was transferred 3 times. How do I fix this? Very frustrating that it was working fine then bam nothing. I was able to get back in right now and of course all the games are over. Makes no sense to me! This app for two years rarely seems to work. I have had an account for those two years and more often than not it tells me there is some kind of issue. I have verified all my login information and yet there is still an issue. This app is a complete waste of my time. During a quick trip today I shut off my tv but my apple tv did not turn off. Later on the go when I tried to load my phone app it would not let me because the tv app was still going. So why not force out my last connection? This seems like a crappy user experience. Tried several different times on different devices to login and always get the same response. Sorry for the interruption we are addressing it asap. But the app never lets you login. Yes I put the correct info. It’s just Worthless! I didn’t think you can make this app any worse on Apple TV than it already is but you managed to do so! Constantly freezing and crashing, telling me technical difficulties try again later, check my internet connection meanwhile I’m hard-wired into 1TB speed network. Still no option to remember my password so quitting app and restarting take FOREVER. I make apps for a living and this is by far some of the worst UX I have ever experienced. NFL Sunday Ticket doesn’t work on Apple TV nor does Apple Airplay despite what the app says and the pathetic ad campaign says each week. The customer service is unresponsive and unhelpful. We’ll see if a letter to the CEO produces some results. I doubt it. Will not go full screen on iPad since upgrade. Continually malfunctions in denying broadcast access to games that are NOT local but the app says they are. Fix it if you want to be regarded as acceptable. I often have the app open on my tablet while watching others games on my TV. I never miss a moment of action. Sunday's are truly Fundays with the Sunday Ticket app. My only complaint is that the app lags behind the TV action by a few seconds but I can tolerate that. Worth every penny I pay. Hi there stranger... thanks for everything you do! Everything I want to watch is blacked out! Can’t get a refund. Why rip off students? I don’t always have time to watch games on Sunday. So I thought the app would be a great way to catch up on games I missed. The problem is the app only lets you watch games from Monday to Wednesday. I try and watch a game on Thursday and all the games are unavailable because it’s a new week and there is a game on Thursday. So you if want to watch a game you only have 3 days to see it before its unavailable. This is ridiculous, I should be able to watch all the games until Sunday. 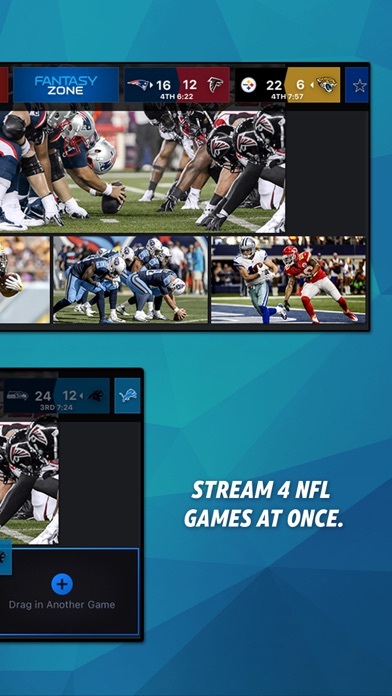 I will not be renewing my contract once it’s done and just buy the NFL Gamepass, that allows you to watch all the games throughout the entire season. I have not been able to login to the app. I have called customer service twice and they say they can’t help me. The online chat help hasn’t been able to fix the problem either. For two straight weeks I have been trying to log into the Sunday Ticket app with no luck. I’ve used chat, called and I have not received any real help from technical support or customer service. Sorry is not fixing the problem! Do better Direct TV! The new view is easy to read yet hides the day/date of the games when a game is blocked. A pain when you a scrolling thru to check game times. Disappointed...... I paid for ALL THE GAMES!!!!! and some are blacked out. I got Sunday ticket and am TRYING to watch on my phone and games are BLACKED OUT!!!! the only games that should be blacked out should be local games that have can get on local network tv. The app won’t connect to my Apple TV box, so I can’t watch on my big screen tv. Other apps connect just fine, just Sunday ticket won’t. Disappointed in the service, but I expect that since att took over. Rate the app keeps coming up every minute! Rate the app keep coming up every minute! Stop asking me to rate you. I like the app. I don’t want to be prompted to rate you everytime after hitting no thanks. My only issue with this app, which I love, is that it won’t allow HDMI output from my phone, half the reason I have the app is to be able to watch football while traveling for work in hotel rooms and holding the phone all game gets old when I could just plug it into the tv. I love this app, but the message to rate it kept coming up until I did even though I click no thanks. It eventually forced me to rate it because it kept interrupting my games. Annoying! They added a new “feature” of instant highlights that constantly pop up and block the screen. They can’t be disabled and you have to manually dismiss each one as it appears. Awful. Will never stop Sunday Ticket! Won’t connect to any games on Wifi or cellular!! Worst season so far! Get job for your 25th season!! Want more money for the max and give crappier service. Installed, logged in, and the app just sits on loading screen. Tried uninstalling and reinstalling to no avail. I keep getting asked to review this app while I am watching the game. Streaming with my google chrome, games come in great!! Stop asking me to rate. I’ve already rated you. STOP POPPING UP!!!! This app was garbage when it was first published and years later it continues to be garbage. My biggest gripe is that I can’t even log in on the iOS app if I previously logged in to watch a game on tvOS app. DirecTV- seriously? I watch part of my game at home, I leave to go somewhere and can’t continue to watch on my iPhone because I need to go back home and log out of the app on AppleTV? Every other network, ESPN, HBO, etc doesn’t have this asinine policy with their streaming content. Money-grabbing morons. Wow this app is great when it’s not raining but all in all it’s football who care what I think I get to watch the games I want and seriously I pay slot but it’s football right !!! Says it’s connected but it just hangs until my AppleTV goes into sleep mode. Love it . Don’t like pop ups. Your app is slow and you ask me to rate it to much. I can’t watch streaming in a good way. Very disappointed for how much money I spend on this!!!! Can’t ask for anything more. Stop telling me to review your app. Stop asking me to rate you. Chromecast failed to load error right away. Could stream on my phone but casting was a no go. Disappointing for such an expensive service. Probably would have said nothing but the app kept insisting I rate it. There ya go. The only reason I'm eating this is to stop it popping up asking me to review every time I try to switch feeds. Even after I rate it, it still pops up. STOP IT AND I'LL CHANGE MY RATING!!!! I’m writing this review because if I don’t it will keep asking me to... the app is pretty good but it doesn’t always cast and loses connection more often than I’d like. Freezes allot even on Comcast WiFi. Works well but occasionally will stop for restart. App needs work switching games. Rated since it kept annoying me. Horrible design. You can only use a single device. Once you login you cannot logout and if u log in on another device it won’t let you. Then u are locked out for the entire season. Useless. Stop asking me to rate! I initially gave it a 4, however it continually asks me to rate the damned app every 60 seconds. Please stop! Probably not paying for this trash next season. Apple TV app is AWFUL. Keeps signing me out when I navigate outside the app. FIX THIS. I should be able to go into my streaming cable app and stay logged into Sunday Ticket app. There is nothing redeemable about this app. The subscription is very expensive and the product is awful. 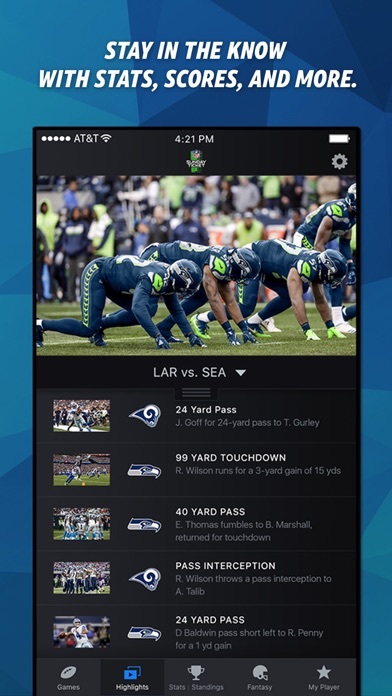 Once the NFL opens up this license to other companies this app is dead. Super F@$/&@ annoying to be constantly asked to write a review every time I switch games. Since ATT combine with Direct TV, the service and support suffered. I have downloaded the Sunday Ticket app, but it does not recognize my email and pw. Along with CS, we have resettled my paw several times. After over an hr. She said that she will transfer me to DTv customer Support. Wait, what?? A waist time! -10 stars is my rating. The sound is delayed about 8 seconds after video. A message pops up every minute asking to rate the app, so I m rating it with the crap rating it deserves. Streaming continuity is complete trash. At the moment I’m not even able to log in. Seeing as the last change made was 8 months ago, it might be time for a update. Downloaded app it says there is a problem will fix asap but its been a week same with the direct tv app as well. Has great potential but buggy. Quits unexpectedly and repeatedly. Most often on the Roku, less on the Fire but still enough times to make me just wanna stop using it and get my money back. Ran best casting from the iPhone. Not sure that’s feasible for a whole season. Would be nice to get NFL Sunday ticket on more than one device at a time. Too hard to get on. Passwords everywhere!!!!!!!! You should reward your continuous customers with discounts. Fantastic !!! And you can cast games as well !!! And now they give us the final preseason week to watch !! Now if only we can get all preseason games !!! It has truly been a fantastic experience using this app this year. Words cannot express how many joys this app has brought during the NFL regular season. The features are really amazing right from how easy it’s to change games to keeping track of scores. 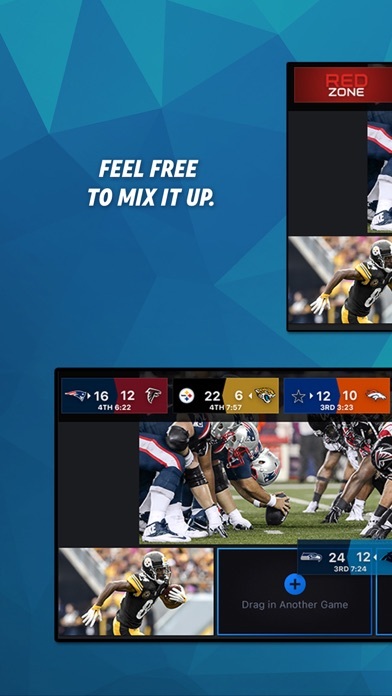 The landscape view is phenomenal and the ability to stream more than one game is epic! DirecTV has done a exceptional job all round. Keeping track of my favorite team was nice but Fantasy layout can be improved. The most annoying part are local blackouts and country restrictions. Otherwise this app is clearly a winner in all respects. I highly recommend this app and is worth the subscription fees any day. 100mbps internet and still couldn’t stream without gaps. “Sorry about the interruption. We’re addressing the problem ASAP.” This is the error message I get every time I’ve tried to log in on anything other than a PS4 since October. It’s a joke. And they won’t refund my money. Paid over $160 for NFL Sunday ticket and cannot sign in to the app. Can’t believe how crappy Directv technology and service is. Call in for help and all you get is very nice people who have not been trained to address any problem that doesn’t involve restarting your system or app. Total waste of money. I have had the Sunday nfl ticket for 12 years. 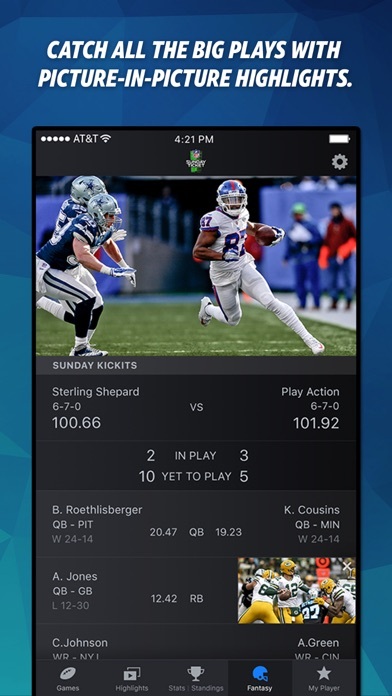 Once the app was introduced it was so much fun because when we had things to do on Sunday’s I could still watch the games no issues! This year every Sunday it says I am logged into the app on another device! I am the only one in my family that has the app! I am the only one that knows the password! It is only used on my phone! How can I be logged in when I am only logged in on device ever!! FIX IT! Consistently get an Invalid Domain Name error after trying to sign in. This app has not worked since ATT bought Direct TV. Really too bad because it was a great app...I downloaded the updated version hoping the bugs were fixed, disappointing to say the least because it is still not working👎🏻👎🏻👎🏻. I have been trying to log into the app for a month now. It just tells me there is an issue and it is being worked on ASAP. A month doesn’t seem asap... please fix. This review is more for the PS4 app, but these big play highlights need to be optional. I can’t tell you how many times I have been watching and a big play highlight comes up regarding a play ahead of what I’m seeing. Other than that, the apps work great. Simple way to turn them off would make it much better. Worked fine for a while but then I switched phones and now the app won’t login on the new phone and keeps saying “Sorry about the interruption. We’re addressing the problem ASAP”. Been like that for weeks and customer service is incompetent. See many people with the same problem constantly tells me I’m signed in on multiple devices. Call for support and people have no idea what I’m talking about just keep asking me for my direct tv account number. Very frustrating app. Never streams well into my iPhone 7 and usually gives me error message. The App offers the option of a recording a game but ONLY ONC THE GAME HAS STARTED! IF I’M ROUND TO START THE RECORDING THEN, THEN IM AROUND TO WATCH THE GAME LIVE! Why can’t the recording option be pre-set??? It’s crazy I pay for all the games but only get 20percent off them we travel a lot so u don’t get Monday Sunday Thursday night local nothing and ever Sunday I end up looking for a stream to watch on some bootleg web site. if u can get dazn it works perfect or nfl game pass if ur over seas. Anyone else having major A/V sync issues when casting? When I cast a game, it's initially nicely in sync; however, as time goes on the, audio and video get progressively more out of sync. I love being able to watch all the games on Sunday, but both the app and the mobile platform are far too glitchy for it to be worth it. There are problems with the software every single Sunday. I will not be purchasing this again. This app says that I’m streaming on another device every single week. It never works until the afternoon games, so i only get ONE extra game per week. Directv will perpetually tell you that there is nothing they can do to sign out this mythical person. Worst service ever. unable to stream video. error 3100. no one can tell me how to fix this. waste of time and money. Terrible never works right and Sunday ticket is worthless! Most games are blacked out anyways! Worst $100 I have ever spent. Sometimes the app just doesn’t ever load and get to a login screen. If you log into their website on a laptop you can view games- which is what direct tv customer service will suggest. Unfortunately it means there is no point to this app. Just use your laptop and go to their website. Several weeks of the season I could not watch my team because it said I was signed in on my phone. I wasn’t. Customer service reads from a script. Their script might as well say “hang up, we don’t care now that we have your money.” — that’s if you can find a phone number to call. What other choice do we have if we want to watch our out of market teams? None.